Does Indo-Japanese friendship demonstrated during the course of Modi’s visit to Japan mean that Delhi's foreign policy has changed course? Where does that leave Russia and China? How to restrain China? - This appears to have been the key issue for the Japanese Prime Minister Shinzo Abe during talks with his Indian counterpart Narendra Modi. Both nations have territorial disputes with Beijing, but Delhi hopes to put them on cold storage. Nevertheless, the Indians agreed to lift ties with Japan to the level of strategic partnership and to regularly conduct joint military exercises with the participation of the United States. Tokyo and Delhi agreed to strengthen military ties as a result of talks between Abe and Modi, who visited Japan on an official visit. Tokyo will supply the Indian Navy with amphibious aircraft. This would be Japan's first overseas military sale in nearly 50 years. This deal would confirm that under Abe, Japan accepted a more assertive approach towards China, according to Reuters. At a joint press conference Abe said that the two countries decided to elevate ties to a “special, strategic global partnership.” Modi said that Japan and India will collaborate in the field of defence technologies and equipment, given shared interest in peace and stability and maritime security. But this general statement didn't seem sufficient to a Tokyo university student. In a meeting with India's leader she asked how Japan and India intended to guard the peace in the region in the face of China's growing presence. The Indian Prime Minister did not mention China, but said that “darkness” was not to be afraid of but to be opposed to with democratic values. Earlier, India's leader lashed out on the “expansionism” of some countries, causing a lot of speculation in Chinese press. It's known that nowadays the country most accused of expansionism by Western politicians is Russia, although China gets its piece of criticism, too. So, who was Modi referring to? 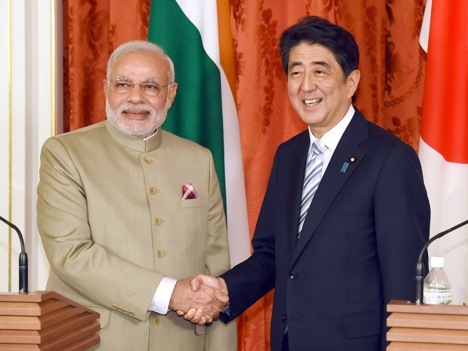 Does the Japan-India friendship demonstrated during the visit mean that Delhi's foreign policy changed course? At the time, the Russian Prime Minister Yevgeny Primakov brought forward the concept of ‘Russia-India-China strategic triangle,’ which Washington countered with the ‘US-Japan-India-Australia alliance of democracies.’ One can expect the attempts to activate this informal union. In any case, American, Japanese and Indian Navy regularly hold joint manoeuvres, Lunev says. Modi's visit has drawn great attention in China. The China Daily claims that the Japanese media are fiercely discussing the “plan of restraining China” which both countries are working on. Meanwhile most Chinese commentators believe that Delhi adheres to a cautious approach towards Beijing. Tsi Minkui , an expert in international affairs at the National Defence University asserts that India has never given a positive reply to Tokyo, emphasizing that it would not join the union aimed at encircling or restraining China. First published in Russian by Nezavismaya Gazeta.